This evening we had torrential thunderstorms roll through and it got dark very early. I had planned to make pizza for dinner but hesitated with all the thunder and lightning because it seemed like the power might go out a few times. After the worst of the storm passed, I went ahead and made a small rectangular pizza using my Herbed Pizza Crust recipe. I browned about 1/2 pound of lean ground beef in a bit of olive oil with 2 sliced green spring onions and some diced red bell pepper and seasoned it with salt and lots of black pepper. I topped my pizza with the beef mixture, some sliced mini San Marzano tomatoes, and turkey pepperoni along with the usual pizza sauce (by DelGrosso) and shredded mozzarella. It turned out great and I have plenty left for a couple of lunches. This is one of my favorite pizza crust recipes. 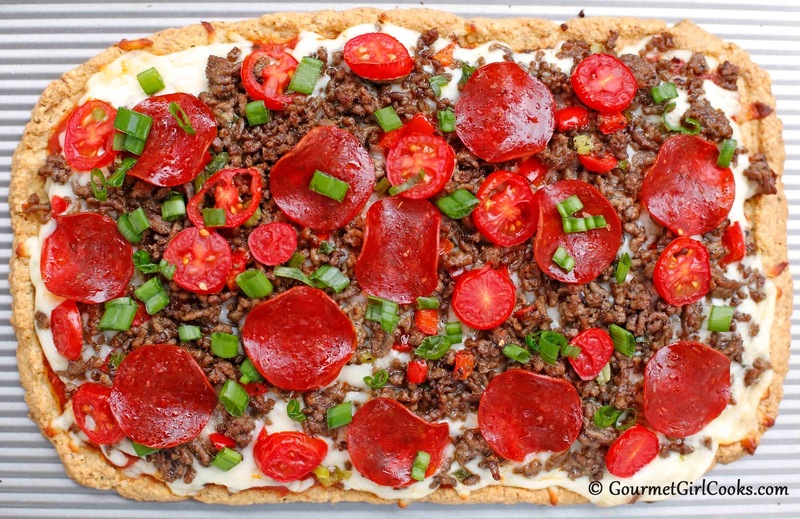 Ironically, after mixing the crust mixture together and placing it in the oven to bake, I received a comment from a follower that deemed this crust the "best gluten/grain free pizza crust recipe" which made my day! It's always nice to hear that others enjoy my recipes as much as I do. I have a number of different pizza crust recipes, but this one is still one of my favorites along with my "No-Flax" Herbed Pizza Crust recipe. 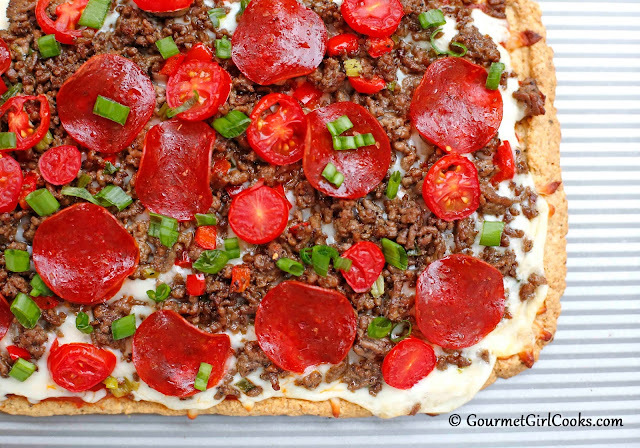 Here is the link to the crust recipe I used this evening: Herbed Pizza Crust - Low Carb. I've also included the recipe below. Enjoy! I'll have to "second the motion" by your commenter ... your pizza crusts and recipes are the best! :-) I happen to have some Fiorucci pepperoni and ground beef on hand. Hmm ... I think I see a pizza in my future!